Hexavalent chromium, also known as chromium-6, first gained notoriety when the film "Erin Brockovich" highlighted the plight of Hinkley, California, where the groundwater had been contaminated. Now the first publicly available national survey on the contaminant from Environmental Working Group reveals that Hinkley isn't alone. Laboratory tests commissioned by EWG have discovered that the chemical is present in the tap water of 31 out of 35 U.S. cities tested, or 89 percent. Norman, Oklahoma; Honolulu, Hawaii; and Riverside, California returned the highest levels of contamination. According to EWG, the National Toxicology Program concludes that hexavalent chromium drinking water contamination shows "clear evidence of carcinogenic activity" in laboratory animals, and that a recent review by the EPA found its presence in tap water "likely to be carcinogenic to humans." Although in 2009 California began setting in motion proposed limits for the amount of the chemical allowed in tap water, the EPA has yet to set a legal national limit and doesn't require utilities to test for it. 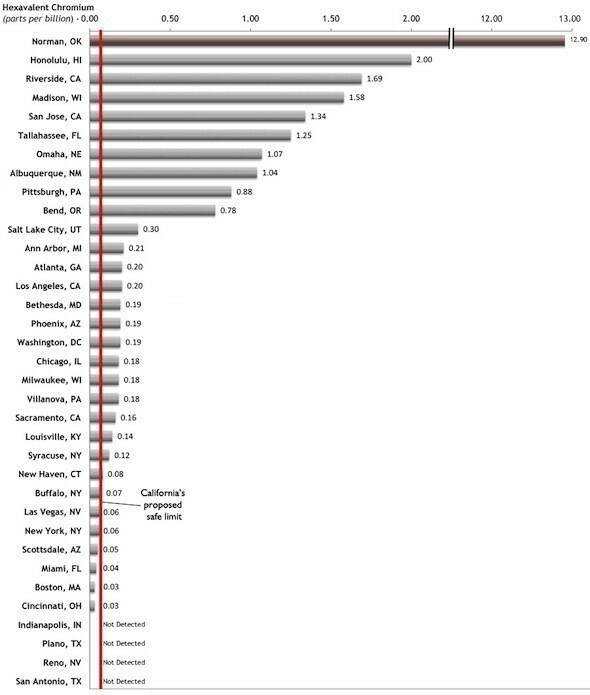 See the image below, provided by EWG, to find out how each tested city ranked, and CLICK HERE to view the full study.